In a new study in cells, University of Illinois researchers have adapted CRISPR gene-editing technology to cause the cell’s internal machinery to skip over a small portion of a gene when transcribing it into a template for protein building. This gives researchers a way not only to eliminate a mutated gene sequence, but to influence how the gene is expressed and regulated. Such targeted editing could one day be useful for treating genetic diseases caused by mutations in the genome, such as Duchenne’s muscular dystrophy, Huntington’s disease or some cancers. CRISPR technologies typically turn off genes by breaking the DNA at the start of a targeted gene, inducing mutations when the DNA binds back together. This approach can cause problems, such as the DNA breaking in places other than the intended target and the broken DNA reattaching to different chromosomes. The new CRISPR-SKIP technique, described in the journal Genome Biology, does not break the DNA strands but instead alters a single point in the targeted DNA sequence. “Given the problems with traditional gene editing by breaking the DNA, we have to find ways of optimizing tools to accomplish gene modification. 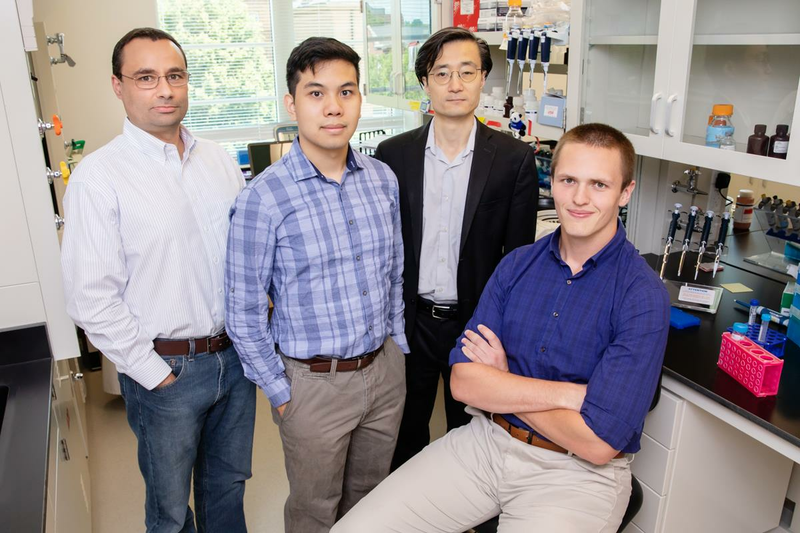 This is a good one because we can regulate a gene without breaking genomic DNA,” said Illinois bioengineering professor Pablo Perez-Pinera, who led the study with Illinois physics professor Jun Song. Both are affiliated with the Carl R. Woese Institute for Genomic Biology at the U. of I. In mammal cells, genes are broken up into segments called exons that are interspersed with regions of DNA that don’t appear to code for anything. When the cell’s machinery transcribes a gene into RNA to be translated into a protein, there are signals in the DNA sequence indicating which portions are exons and which are not part of the gene. The cell splices together the RNA transcribed from the coding portions to get one continuous RNA template that is used to make proteins. CRISPR-SKIP alters a single base before the beginning of an exon, causing the cell to read it as a non-coding portion. “When the cell treats the exon as non-coding DNA, that exon is not included in mature RNA, effectively removing the corresponding amino acids from the protein,” said Michael Gapinske, a bioengineering graduate student and first author of the paper. While skipping exons results in proteins that are missing a few amino acids, the resulting truncated proteins often retain partial or full activity – which may be enough to restore function in some genetic diseases, said Perez-Pinera, who also is a professor in the Carle Illinois College of Medicine. There are other approaches to skipping exons or eliminating amino acids, but since they don’t permanently alter the DNA, they provide only a temporary benefit and require repeated administrations over the lifetime of the patient, the researchers said. The researchers tested the technique in multiple cell lines from mice and humans, both healthy and cancerous. They sequenced the DNA and RNA from the treated cells and found that the CRISPR-SKIP system could target specific bases and skip exons with high efficiency, and also demonstrated that differently targeted CRISPR-SKIPs can be combined to skip multiple exons in one gene if necessary. The researchers hope to test its efficiency in live animals – the first step toward assessing its therapeutic potential. “In Duchenne’s muscular dystrophy, for example, just correcting 5 to 10 percent of the cells is enough to achieve a therapeutic benefit. With CRISPR-SKIP, we have seen modification rates of more than 20 to 30 percent in many of the cell lines we have studied,” Perez-Pinera said. The group built a web tool allowing other researchers to search whether an exon could be targeted with the CRISPR-SKIP technique while minimizing chances of it binding to similar sites in the genome. Since the researchers saw some mutations at off-target sites, they are working to make CRISPR-SKIP even more efficient and specific. The National Institutes of Health, the National Science Foundation and the American Heart Association supported this work. The conclusions presented are those of the researchers and not necessarily those of the funding agencies. The paper “CRISPR-SKIP: programmable gene splicing with single base editors” is available online.